The student symposium programmers must’ve wanted this year’s batch of up-and-comers to stay hopeful and excited about the world. In a festival packed with grim content (most notably Steve McQueen’s Hunger which explores the Irish Republican Army’s 1981 hunger strikes in Long Kesh prison; Gomorrah which brings Roberto Saviano‘s expose of contemporary Neapolitan crime to the silver screen; and Nandita Das’ Firaaq which takes on the 2002 communal violence in Gujarat India through a series of tragic vignettes), we skipped out on some of this darker material and saw a disproportionate number of films celebrating life and human beings in their best form. Elizabeth Chai Vasarhelyi’s documentary Youssou Ndour: I Bring What I Love, which follows the great Senegalese musician through the contentious release of his latest album, Egypt, certainly fits this category. More than the filmmaking, Peter Sellers’ loving introduction and the sounds pouring out of Ndour’s heart convinced me this guy was about more than being one of the biggest musical sensations of our time. 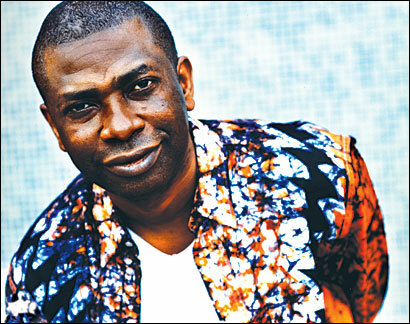 Indeed, Youssou Ndour begs us to fill our souls with light and hope, to face our friends and enemies with nothing but love, and to sing and dance with our whole beings. And, after the documentary and the live three song set Ndour shared, it became pretty much impossible to say no. The series “Laughing ‘Til It Hurts,”composed of four slapstick shorts from the pinnacle (and end) of the silent era, provided another instance at Telluride where joy was unabashedly held up as something to be saught, captured, and savored at all costs. The series was curated by Paolo Cherchi Usai, a man who–from his position as director of the National Film and Sound Archive of Australia to his wiry, hunched figure and sun-deprived aura to his beautiful indignation that silent film might EVER be considered primitive or “less than”–perfectly fits the mold of silent-film archivist and enthusiast. And great choices he made. 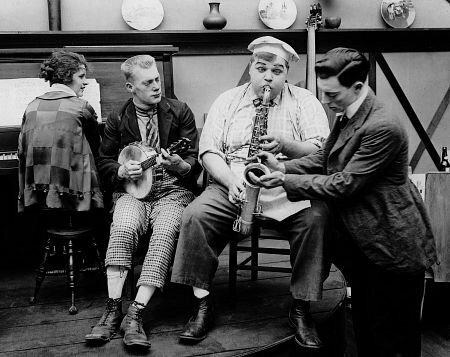 The Cook (d. Roscoe Arbuckle, 1918), Should Men Walk Home (d. Leo McCarey, 1927), There It Is (d. Harold L Muller, 1928), and Pass the Gravy (d. Fred L. Guiol, 1928) kept the audience rolling (especially the ridiculous, squawking woman behind me) pretty much the whole time. As it turns out, fat dogs running up ladders and dinners made out of the neighbor’s prize-winning chicken are still unmanageably funny. Above all, Mike Leigh’s new film Happy-Go-Lucky–which will show as part of the Walker’s Mike Leigh Regis Dialogue and retrospective this October–embodies the world view behind the slapstick-ers’ comedy and Youssou Ndour’s music. Poppy (Sally Hawkins) is an elementary school teacher who maintains a pretty serious high-on-life disposition and calls on those around her–a disgruntled but complicated driving instructor, an impassioned flamenco teacher, one feisty, sarcastic sister and one super square sister–to do the same. That we sometimes identify with these supporting characters’ impatience and frustration with Poppy and her perpetual joy, drives the point home. For when Poppy brings unharnessed energy into the suburban home of her married and pregnant sister, or goads the inner rage of her driving teacher, or wanders into desolate surroundings and shares a moment with a crazy person, we’re put on edge. We get annoyed or tense up in response to Poppy’s behavior. And just at that moment, it becomes crystal clear that through Poppy, Leigh is asking all of us cynics in the dark theater to give ourselves over to optimism, to see colors in all their vibrancy and life in all its opportunity, and to engage in the joke before all else. Once I realized Poppy and Leigh have a point, a really really good point, Poppy transformed from a naive and slightly annoying distraction into a mindful being exercising the courage to confront the world’s bleak moments with laughter and grace. Leigh and Hawkins serve up digestible portions of this life philosophy throughout the film; The wild giggling of best friends, Poppy’s mantras of you’ve got to make your own luck, haven’t you?, and Leigh’s choice of Kodak’s brand-spanking-new color-friendly film all work to shout, go ahead and live!